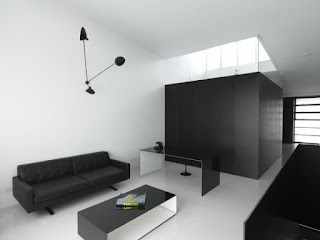 It'll Be Fun...: Why is Minimalism always so bright white? Why is Minimalism always so bright white? I'm very excited to be embarking on a journey towards simplicity with A Simple Year. It coincides with a lot of my goals around decluttering my home, preparing to move in with my partner, simplifying and de-busying my life, and being more deliberate with my finances. I've been reading a lot more blogs about simplicity and minimalism when it comes to fashion, wardrobes and homes and a commonality that I keep seeing is white, black and pastels. Don't get me wrong, I love a good black and white, especially in fashion. It's classy and clean. But I am a vibrant and colorful person. Why is every single blog about minimalism and decluttering seem to think people want a pristine white (boring!) decor? Where are my minimalists that love color and art? Clean surfaces and fewer items, a streamlines closet, everything in it's place. But with vivid design, textures and maybe a vintage feel? Anyone help a girl out?